يقع فندق Hotel Durville، المصمم ليناسب كل الضيوف سواء كانوا من رجال الأعمال أو السياح، في مكان ممتاز في أحد أكثر المناطق تفضيلاً في Blenheim City Center. يجذب هذا الفندق ذو 4.5 نجوم، والذي يبعد فقط عن وسط المدينة و عن المطار، الكثير من الزوار سنوياً. يوفر الفندق بفضل موقعة الجيد وصولاً سهلاً إلى أهم معالم المدينة.
. إن الخدمات الممتازة وحسن الضيافة العالي في Hotel Durville تجعل إقامتك تجربة لا تنسى. يقدم الفندق واي فاي مجاني في جميع الغرف, مرافق مخصصة لذوي الاحتياجات الخاصة, تخزين الأمتعة, صف السيارات, خدمة الغرف لضمان الراحة القصوى لضيوفه. 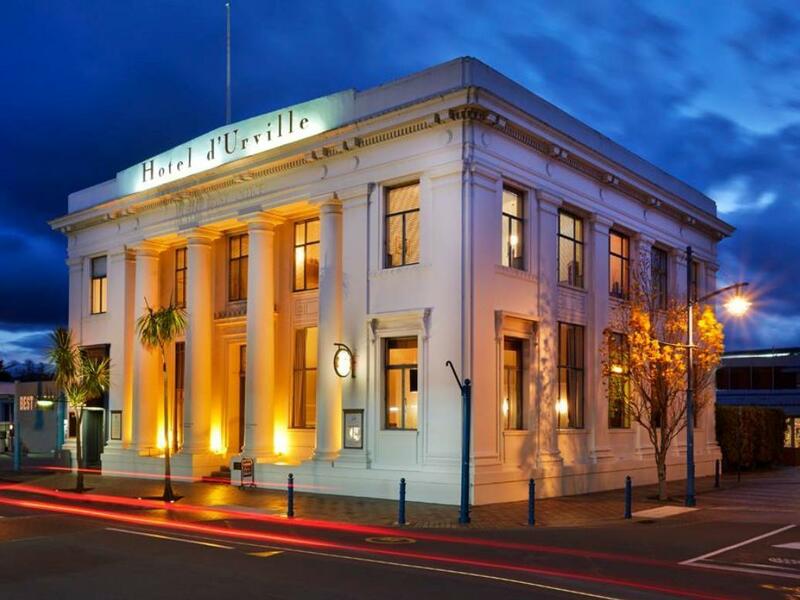 تنعكس أجواء Hotel Durville في غرف الضيوف.تلفزيون بشاشة مسطحة, اتصال لاسلكي بشبكة الإنترنت (مجاني), غرف لغير المدخنين, مكيف هواء, تدفئة هي بعض الميزات الموجود في العديد من الغرف. كما أن مجموعة الخدمات الواسعة الموجودة في الفندق لضمان راحتك تترك لك الكثير من الخيارات لقضاء وقتك أثناء فترة إقامتك. يحظى فندق Hotel Durville بموقع ممتاز وخدمات يصعب منافستها. Friendly staff, central location with parking available. Quirky rooms in an old bank building. The hotel is in the middle of town, minutes away from numerous bars and restaurants. Our room was quiet and comfortable and the onsite parking was a positive. We’d stay there again. Excellent hotel, creative decor, friendly helpful staff, a building with a difference, and a free Port at night. Meh. We visited over New Years. There was very little open in the area and the hotel restaurant also shut down. The list that the front desk gave us included "open" places that turned out to be closed, which was pretty annoying. The room was quirky, but not really worth the extra money over a solid chain hotel. No meaningful unique touches. One great thing was the reliable wifi. My partner and I stayed here for two nights at the beginning of our NZ trip. We stayed in the "Retro room" which was a ground level unit, with our bed up on a mezzanine floor. Very funky little place - which we both really liked! The building itself is the old Public Trust building - and still has a lot of character to it. The staff were lovely and welcoming - and very genuine people - which was lovely. Wifi was free - which was good - and seemed to work well. The restaurant food was amazing... I think we were wishing we had have eaten there both nights. The best steak I've had in a long long time!! (and I'm a bit fussy about my steaks!). I heard that the desserts were just as good - although we were a bit tired, so didn't get to try it out! Would definitely recommend this lovely hotel for others - great price for these rooms! This hotel is ideally located. It has excellent rooms in a very unique old bank-like building. The new owner is extremely friendly and attentive. We would highly recommend staying here! Fabulous old building, great receptionist soo helpful. Just loved the accommodation and the restaurant down stairs was fabulous. I rarely eat red meat but decided to try their beef OMG mouthwatering and their pavlova was to die for.